The Mighty Ducks is a mightily sloppy movie. It can’t decide whether it wants to be a Bad New Bears for hockey, a Slap Shot for youngsters, or standard, live-action Disney fare. Featuring an atrocious performance from Emilio Estevez, it contains nearly every cliché featured in a sports movie. However, it also contains none of the self-awareness that made a cliché-fest like Dodgeball refreshing. Part of the problem with the movie’s tone resides in the contrast between the various source materials and Disney’s desire for generic kids’ fare. It allows for scatological humour aimed at children but wholly inappropriate for them. That said humour is conducted by the child stars themselves robs them of some endearment, despite the movie’s pervasive sweetness to the point of becoming saccharine. 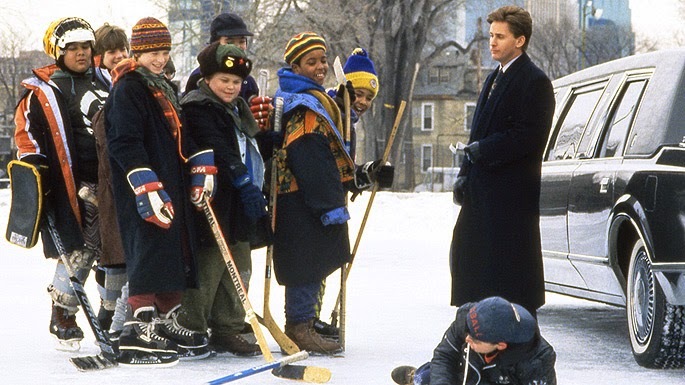 Add to that the fact every message the movie delivers comes across with all the subtlety of a sledgehammer and The Mighty Ducks can rightly be considered a disjointed mess that glosses over any problem a character might be having in favour of nonsensical fun. That being said, my love for this movie’s never diminished. There are nostalgia factors; this is the first movie I ever saw unsupervised at the theatre. It’s also a sports movie, which inherently gets my blood running. When the Ducks finally hit their stride and stop being a children’s version of Slap Shot’s Chiefs, the on-ice action becomes exhilarating. The movie’s power is heightened by the performances of Heidi Kling and John Beasley as two of the players’ parents. Watching Kling explain to the Ducks’ coach (Emilio Estevez) how hard things are on her son, it’s affecting. When Beasley dad scolds Estevez for teaching his kids to cheat, it’s relatable. In fact, parents’ performances work to conjure real sympathy for the team, giving audiences an actual reason to care about the outcome. This sympathy, mixed with some exciting hockey scenes, manages to cancel out the movie’s glaring flaws. At least for me, it never fails to make me smile. Considering that’s a feeling I don’t usually get from more prestigious pictures, that’s at least something The Mighty Ducks really has going for it.